Yellow goat fish on the barrier reef. The Snorkelling experience on North Caicos and Middle Caicos is highly dependent on the weather. When the ocean is calm, snorkelling at the sites listed below can be great. North Caicos and Middle Caicos are located in the centre of the Turks and Caicos archipelago and are connected by a road causeway. Due to the low levels of development and the extensive south side wetlands on the two islands, the only accessible beaches and snorkelling sites are found on the northern coasts of the two islands. When compared to the beach snorkel sites on Providenciales, the snorkelling on North Caicos and Middle Caicos comes up a bit short. 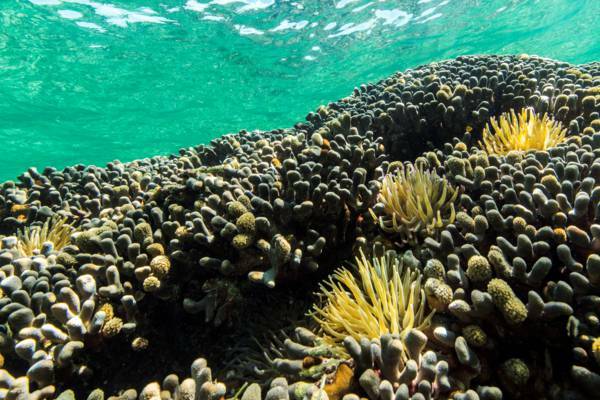 This is largely due to the beaches being more exposed to the weather and waves, and consequently having rougher conditions and poorer underwater clarity at the shore reefs. 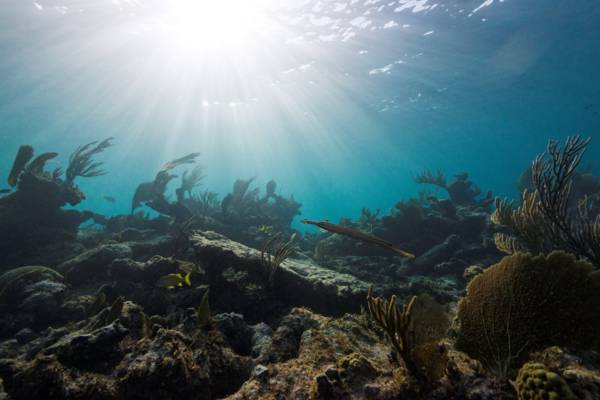 The Caicos barrier reef, which surrounds and protects the Caicos Islands group, offers an amazing array of wildlife and healthy hard and soft corals. Sea anemones on a coral head. The shallow reef locations tend to be the best for snorkelling, and support bright yellow and purple sea fans, elk horn coral, and many other types of soft gorgonians. Schools of stoplight parrotfish, bluehead wrasse, yellowtail snapper, horse-eyed jacks, French grunts, and blue tangs are common. Larger fish and animals are also seen, including the southern brown stingray, eagle rays, green turtles, hawksbill turtles, spiny lobsters, nurse sharks, barracudas, and even dolphins! The tiny creatures can be the most interesting of all. There are banded coral shrimp, garden eels, octopus, damselfish, flamingo tongue cowries, flamboyant marine worms, and the rare zebra-patterned spotted drum. The offshore reefs that are accessed by boat tend to be much better, with vibrant coral and fish, and exquisite visibility. 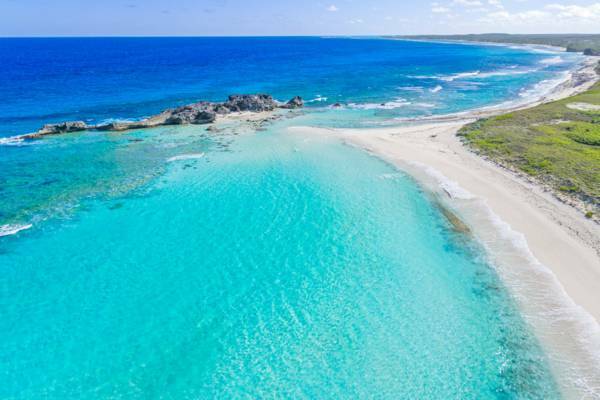 Unfortunately, the number of water sports and boat charter businesses are limited on these two islands, so it can be difficult to arrange a visit to the quite beautiful and relatively sheltered reefs that are located off the sparsely populated northeast end of North Caicos and Middle Caicos. Flamingo tongue cowries on a yellow sea fan. It’s easy to miss many of the tiny and fascinating sea creatures if you don’t look carefully. The scenic Three Marys Cays on North Caicos typically offers the best beach snorkelling during typical weather conditions. Like most shore reefs on the two islands, this site is best when it’s not too windy. Check the Wind and Wave Forecast. If the breeze is under 12mph (19kph), Three Mary’s Cays will likely be decent. The cay closest to the beach is the best for snorkelling. Simply explore around its perimeter. Mudjin Harbour is one of the most recognizable coasts in the Turks and Caicos, with its high limestone cliffs, caves, and the rocky Dragon Cay. Unfortunately, it’s often too rough for pleasant snorkelling, but during good conditions there is excellent snorkelling around Dragon Cay. Sharks and some of the other larger sea creatures can often be spotted. Aerial view of Mudjin Harbour Beach. Similar to Mudjin Harbour Beach, Conch Bar Beach is quite close to the barrier reef and deep water. There is clear blue water and coral gullies to explore. Also like Mudjin Harbour, this beach is only suitable for snorkelling when wind and wave conditions are calm. The far side of Pelican Cay at Bambarra Beach on Middle Caicos also features fascinating underwater sights. This small cay is quite a wade out from the beach at Bambarra, so be prepared. Below are the best locations for snorkeling from the beach on North Caicos and Middle Caicos. Unfortunately, the snorkeling gear sales and rental options on these two islands are quite limited. You may be able to find a basic mask and snorkel in one of the small gift or variety shops, but you won’t have many options to choose from. We highly recommend bringing equipment with you. Several water sports stores on Providenciales offer great selections of masks, snorkels, fins and vests. Don’t touch or stand on anything. 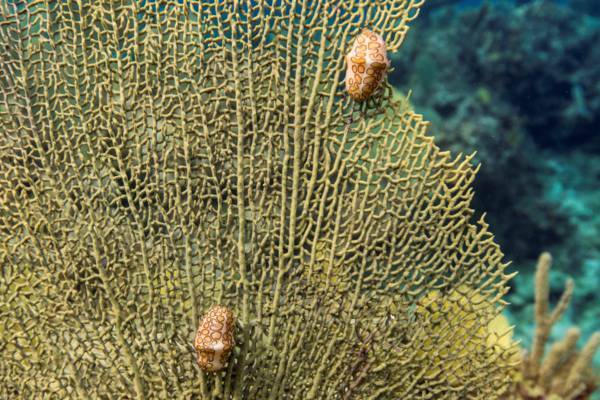 Coral is a living animal and you will likely kill or severely harm any part you contact. Make sure not to brush anything with your fins or gear. Don’t take anything. This includes all shells, sand dollars, sea urchins, starfish and small pieces of coral. Please use reef safe sunscreen when in the ocean. Don’t follow closely or chase any sea life. Don’t attempt to feed any sea life. Last reviewed by an editor on 21 August 2018.